One way to make your fish tank look vibrant and lively is to add some aquatic plants. Adding natural plants in your aquarium also provide oxygen, food, and natural water filtration for your fish. Aquarium plants are a great way to create a natural ecosystem for your fish. If you already have an aquarium with fish at home, your aquarium fish could benefit in many ways from aquatic plants. They get a fresh supply of oxygen and some plants also provide food for your aquarium fish. Plants purify tank water by taking in waste to produce the nutrients they need. Plants also provide a natural carpet for the fish tank floor, a natural hiding place for fish that also conceals pumps and fixtures of the aquarium and creates an ecological balance in the aquarium. When you are choosing your aquatic plants you want to make sure that they are naturally resilient, hardy and low maintenance. 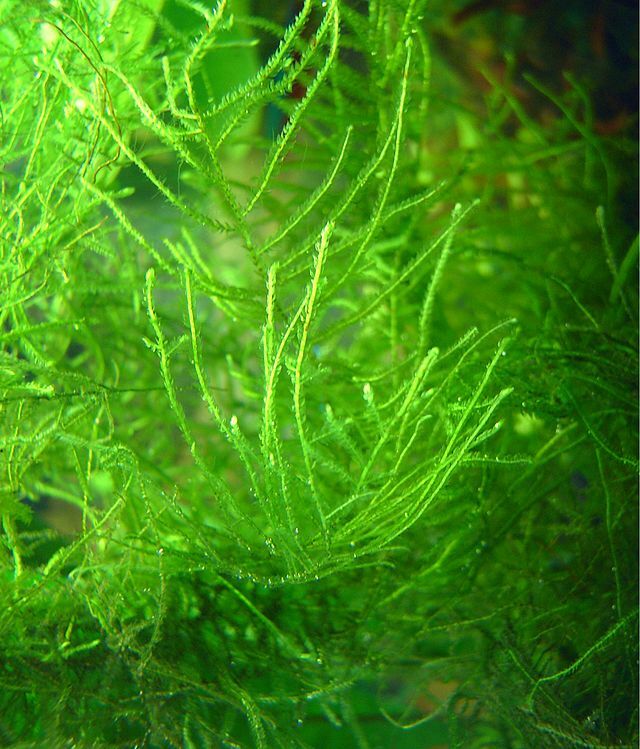 The best plants for your fish tank or aquarium would be green plants. Green plants don’t need that much sunlight and care. Growing aquatic plants in your aquarium is not that hard. With a little guidance, practice and knowledge, you could increase your success rate significantly. There are a wide variety of aquatic plants you can choose for your aquarium. There are many different types of plants you could grow. Some plants float on the surface while others stay rooted at the bottom. Some are used for background and midground. We will discuss 5 plants here that look great in your aquarium for all different purposes. Water wisteria has tall lace like green leaves that could provide a beautiful green carpet for your aquarium. They spread out fast rather than growing tall. These plants are easy to grow and need minimal maintenance. They need moderate light and do well between the temperatures of 74 to 82 degrees. “Javamoos” by Buchling at the German language Wikipedia. Licensed under CC BY-SA 3.0 via Wikimedia Commons. 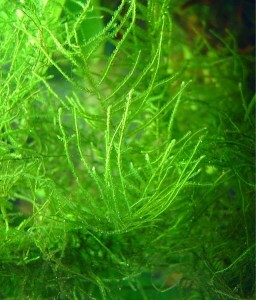 Java moss is a popular plant for aquariums which is also a low maintenance plant. They tend to grow on driftwood and rocks. They grow fuzzy and green at the bottom of the aquarium, and could provide protection for baby fish. They do well in all kinds of light and in temperatures between 70-90 degrees. These plants have green tall leaves that resemble swords, and hence the name Amazon sword. They are excellent for providing a background or mid-ground for your aquarium which would be ideal for hiding your aquarium fixtures and provide hiding places for your fish. They can be up to 20 inches tall and often planted at the back of the aquarium in groups. They do well in temperatures between 72 to 82 degrees and need moderate lighting. Java fern is a beautiful plant with long green leaves in bunches that can grow just about anywhere in your aquarium. It’s a low maintenance plant that can be used as a background for your aquarium. They need low to medium light and do well in the temperature range of 68-82 degrees. These plants provide excellent hiding places for fish. These spectacular plants have wide circular green leaves with red stripes that are ideal for decorating the background of large aquariums. The green tiger lotus needs very little maintenance and thrives in normal environmental conditions. These plants grow to up to two feet tall and need medium lighting. Ideal temperature range for these plants is 71 to 82 degrees. So, these are the top 5 of my favorite aquarium plants. You could buy them at your local pet supply store or from some of the online places listed below at the resource section. I am sure you will enjoy growing these plants in your aquarium without any trouble. For more information on aquaponic systems or raising fish at home in aquariums, or if you would like to start your own fish farm, please give us a call at (303) 495-3705 or Click Here to book a meeting with us. We’d love to hear from you, so please leave a comment in the comment box below or click here to visit our Facebook page. This is a great list of plants, however I think anubias should definitely be on this list or at least a runner up. It’s one of the easiest plants to care for and makes a great addition to most aquariums. But overall good information in this article. If we add in a fish tank for aquaponics system aquatic plants which generate oxygen and are also good source of food for fish, will the nutrients be depleted in the water which supplies the plants being grown? We certainly can help you with your aquaculture consulting needs. Here are several things we can do for you. First, we are going to make you a FREE member of our site where we teach courses and have live webinars about all kinds of aquaculture and agriculture. That site is called http://www.eatcommunity.com and you will get an email with login instructions.